Attention Darwinists: A crucial next step in the evolution of the ice cream sandwich is under way in California, and it goes by the name of Milky Bun. The genetic breakthrough you see above was discovered by the dairy scientists at Afters, a just-opened Fountain Valley ice cream shop where you can eat a scoop of your favorite flavor inside a glazed donut bun. 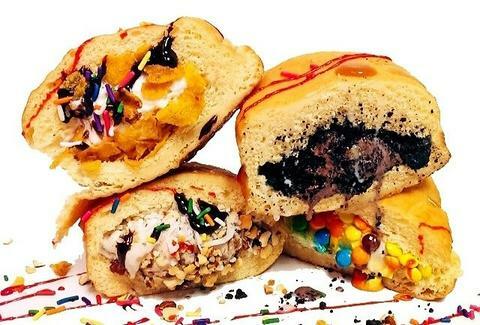 Your stuffing options aren't too shabby, either -- Afters has everything from milk-and-cereal to cookie butter ice cream to cram inside your donut shell, which gets "sealed" via a waffle iron-like press for the ultimate icy-hot experience. Sorry, Shaq.